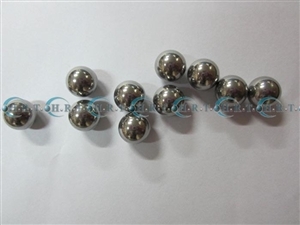 Materials: Small ball bearings, use of high-quality vacuum degassing steel, the material is GCr15, an internationally advanced level of processing technology (protective atmosphere heat treatment, surface hardening, etc.). Standard: in strict accordance with ISO9002 quality assurance system standard to organize production. Accuracy G5, G10, G16 and so different accuracy level. Meet the national standard GB308-2002 and ISO3290-1998 international standard. Range:: Suitable for all kinds of ball bearings, motor bearings, auto steel balls, precision machinery, electrical, equipment, apparatus, transportation vehicles, household appliances into.